XBar | Hyatt Regency | Los Angeles. This idea came to us from X Bar at the Hyatt Regency Hotel in Los Angeles. They use a Pink Lady cocktail, but you can use other pink cocktail recipes, including two different pink Martinis. Alternatively, you can buy green sanding sugar, which is available in both emerald green and pastel green. 3. GRATE the lime zest and mix it 50:50 or as desired with the green sugar. Place on a plate. 4. DIP the rim of a Martini glass or sherbet champagne glass 1/4-inch deep in a shallow bowl of water. Remove, shake to eliminate drips and place in the sugar mix, twisting the glass to coat the rim. 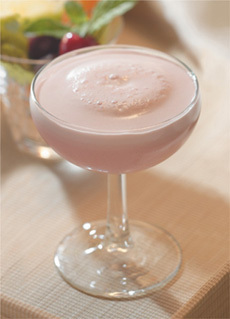 The Pink Lady is a classic gin-based cocktail that may have been named after a 1911 musical of the same name. The pale pink color comes from grenadine; the foamy top is created by an egg white. A favorite of society ladies of the 1930s, the drink was widely known during Prohibition (1920-1933) but fell out of favor in the 1960s. One theory is that the [typically male] journalists who wrote about cocktails and the [typically male] bartenders who mixed them had little interest in pink, “girly” drinks. The original recipe had only three ingredients—gin, grenadine and egg white—shaken and strained into a glass. Over time, some versions added lemon juice, applejack (apple brandy) and even cream (which could be substituted for the egg white or used in addition to it). Here’s more Pink Lady history. We’re opting for the version with apple brandy, for more flavor. If you don’t have apple brandy, you can substitute apple schnapps (apple liqueur), which Appletini lovers will have on hand. If you don’t want to use any apple brandy, make the cocktail with two ounces of gin. If you don’t want to use an egg white, use heavy cream (but don’t use lemon juice—it will curdle the cream). 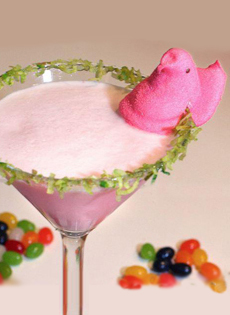 The classic recipe uses a maraschino cherry for garnish, but for our Easter cocktail, the cherry gets replaced by a pink Peep. 1. COMBINE the first six ingredients in a cocktail shaker and shake vigorously until everything is mixed well (the shaker should be frosted over). Strain into a rimmed Martini glass. Shake the cocktail vigorously so the egg white foams into a creamy top. Photo courtesy Pom Wonderful. 2. SLICE a notch into the bottom of the Peeps chick. Place on the rim of the glass. 3. SERVE with a shot glass or ramekin of miniature jelly beans.